The function of the various blocks are as follows. This is the cathode ray tube which emits electrons that strikes the phosphor screen internally to provide a visual display of signal. This is a wide band amplifier used to amplify signals in the vertical section. It is used to delay the signal for some time in the vertical sections. It is used to generate the sawtooth voltage required to deflect the beam in the horizontal section. This is used to amplify the sawtooth voltage before it is applied to horizontal deflection plates. There are two power supplies, a —ve High Voltage (HV) supply and a +ve Low Voltage (LV) supply. 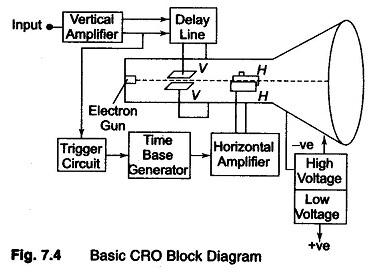 Two voltages are generated in the CRO. The +ve volt supply is from + 300 to 400 V. The —ye high voltage supply is from — 1000 to — 1500 V. This voltage is passed through a bleeder resistor at a few mA. The intermediate voltages are obtained from the bleeder resistor for intensity, focus and positioning controls. The accelerating anodes and the deflection plates are close to ground The ground potential protects the operator from HV shocks when making connections to the plates. Less insulation is needed between positioning controls and chasis.